Tony Pringle, 80, a member of the Newmarket Local History Society, got interested in the subject "quite by chance as I was getting some photographs of war graves and saw two graves of Russian officers". Mr Pringle ordered his death certificate, which said: "Cause of death: Not being of sound mind did shoot himself with a revolver at the Russian Officers Camp, Exning, on 24 January 1920." "They [the White Russians] thought the Bolsheviks were a bunch of criminals who as soon as they were challenged would crumble and run away like rats on a sinking ship," he said. "They found it very hard to make a living. Many also moved to Berlin and Paris. In France many got jobs with Renault cars," he said. "It took a while to get them fit enough and then they were trained in the use of the latest weapons," he said. "It must have been a bit of a cultural shock for them, but they at least got proper food. "Part of the reason for dumping them in Newmarket was to get them fighting fit, so they could return to Russia. 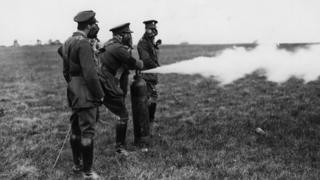 "It wasn't altruistic of Britain - it was to replace the British troops out there."